Dr. Annemieke Aartsma-Rus played an important role in the development of the antisense mediated exon skipping therapy for Duchenne muscular dystrophy during her PhD research (2000-2004) at the Leiden University Medical Center, Department of Human Genetics (the Netherlands). Since September 2004 she continued this research as a post doc under supervision of Dr. Judith van Deutekom. As of December 2007 she became leader of the “DMD exon skip group” first, as assistant professor and currently as associate professor at the Department of Human Genetics. Since 2013 she has a visiting professorship at the Institute of Genetic Medicine of Newcastle University (UK). In 2014 she was selected as the second most influential scientist in Duchenne muscular dystrophy in the past 10 years (2005-2014) by Expertscape based on contributions to the understanding and treatment of Duchenne muscular dystrophy. Thus far, she has published over 90 peer-reviewed papers and 9 book chapters, as well as 13 patents and has edited one book. She has given many invited lectures at meetings, symposiums and workshops as well as patient/parent organizations meetings. She has created and maintains a website on exon skipping, containing a dedicated section for patients and parents as well as patient-friendly pages on therapeutic approaches for the TREAT-NMD website. In 2011 she received the Duchenne Award from the Dutch Duchenne Parent Project in recognition of this work and her dedication to the Duchenne field. She participated in the EMEA/TREAT-NMD steering committees for Workshops on Trial Protocol Design for Regulatory Approval of AON Therapies in DMD and on EMA guidelines for trials in DMD and BMD patients and was a working group member of the NIH/FDA conference on antisense oligonucleotide therapies in neuromuscular disease and was co-organizer (with Prof. Muntoni) of a European Neuromuscular Center (ENMC) workshop on exon skipping for Duchenne muscular dystrophy. She was/is involved in numerous EU-funded projects (TREAT-NMD, Bio-NMD, SCOPE-DMD, BIO-IMAGE and NEUROMICS). She is chair of the COST Action “Networking towards clinical application of antisense-mediated exon skipping for rare diseases”, vice chair of the executive board of the TREAT-NMD alliance, a member of the scientific counsel “Molecular and pathophysiological basis for muscular dystrophies” of the Association Française contre les Myopathies (AFM), member of the board of directors of the Oligonucleotide Therapeutics Society, member of the International Rare Disease Research Consortium (IRDiRC) Working Group of Advance Therapies, associate editor of the Journal of Neuromuscular Diseases, a member of the editorial board of the World Journal of Medical Genetics, Cardiovascular Genetics and Genomics and a member of the TREAT-NMD project ethics counsel. 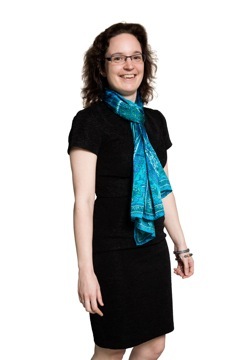 In 2013 she was elected a member of the junior section of the Dutch Royal Academy of Sciences, which consists of what are considered the top 50 scientists in the Netherlands under 45.